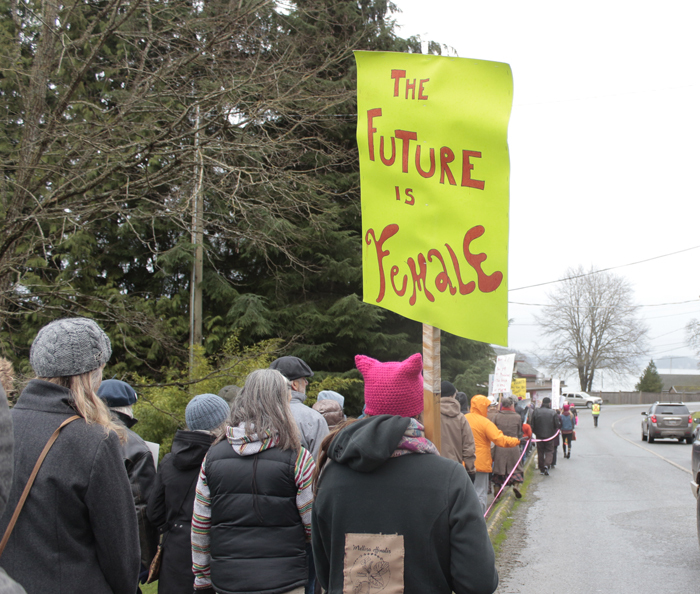 Part of last year's Women's March on Salt Spring. This year's version is on Sunday, Jan. 20, with events beginning at 1 p.m. outside of the library on McPhillips Avenue. The Salt Spring Women’s Walk 2019 takes place on Sunday, Jan. 20 beginning at 1 p.m. on the steps of the Salt Spring Public Library on McPhillips Avenue. Events will include women speakers, a silent walk around Ganges and music/dancing back at the library. Sharyn Carroll, one of the organizing team members, explains why she is joining the global 2019 Women’s March movement by participating in Salt Spring’s event. The Women’s March started in 2017 as a response to an election. The movement has grown over these last three years to include women across the world. Most women are mobilizing for women’s empowerment on every continent while also giving voice to local issues. I march because feminism is not a dirty word. I live in a culture where the “F” is sometimes viewed as something you would not want to find on the bottom of your shoe. But in fact when feminism works we all stand to gain. Because at its heart, feminism is based on the ideal of equality for all. Intersectional feminism also sees how traditional gender roles trap men and boys. Across the planet we’ve seen a movement towards divisive and hate-filled politics: What is happening now is not something that I thought I would see in my lifetime. Protectionism of the status quo and politics of divisiveness. Only when we allow ourselves to be divided and not stand up for one another does everyone lose. Someone asked me the other day, “Why participate in this feel-good exercise? You know none of this is going to change anything.” The march itself, in all these communities, may not change whose finger is on the red button this minute, but I believe that each step, no matter how small, can lead to greater, lasting change. This is the planet we inhabit and no matter what our belief system we are all interdependent, so it is our duty to stand up and say something for the betterment of all.